A family in the making. “Fathers, do not exasperate your children; instead, bring them up in the training and instruction of the Lord” Ephesians 6:4 (NIV). I spent my formative years with my mother. By the time my father became a steady presence in my life, I had many walls up because of his absence the first 14 years of my life. As a result, I never developed a normal father/daughter relationship. I don’t know firsthand what it’s like to have an engaged father in the household. My husband was alive the first two years of our son’s life, and I had the opportunity to see the dynamics of fatherhood and how a man relates to his child. However, the short time he spent with our son wasn’t enough for me to really see how different women and men parent and teach children. 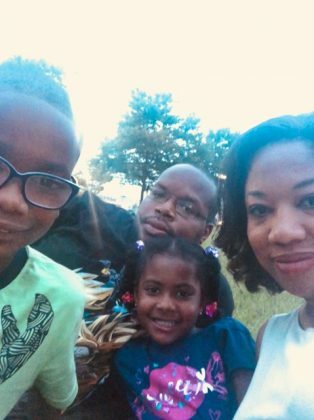 Now that I am in a serious relationship (we are planning to get married) and my children are older, seven and four, I see how different the parenting approaches can be when it comes to men and women. I first noticed this at the barbershop. I am the doting and nurturing mother. I am very protective of my children. It’s very hard for me to see them uncomfortable, anxious, fearful, sad or in pain. Whenever I sense uneasiness in them, I try to comfort them immediately without question or hesitation. However, one day at the barbershop I used a different barber. Kent hopped in his chair and the barber proceeded to cut Kent’s hair. Kent started to squirm and whine and the barber said to him repeatedly, “Stop moving. Relax. Sit down.” While he said this, he tightly gripped Kent’s head so he could line him up. Now, this barber wasn’t the smiley one. He didn’t come across as warm to me. So when I heard him correcting Kent, my mommy instincts wanted to jump in and say, “Kent, stay still. You’re almost done.” I wanted to act as the final authoritative voice and insert the “lovey dovey” stuff. You know the things moms say and do? However, wisdom told me to keep quiet and let the man be the man because Kent needs to experience correction and direction from a man. I’ve learned that men bring a different energy and intent to teaching and discipline. So, I sat there quietly. When he was done, it was the best haircut Kent’s had since we moved back to Maryland. It’s the same with my significant other. We’ve been together for two years now (been friends for 20 years), so we’ve integrated him into our family as we transition into marriage, and because I have seen his heart for my children and how important it is for him to be a good father figure, I’ve allowed him to do some teaching and correction. However, the little I’ve allowed him to do as we transition into an official family is eye opening to me because his style of teaching is completely different from mine, but I see it’s necessary. This weekend confirmed this for me again as we both taught my son how to ride his bike. This was the second time we took the kids out to learn how to ride bikes. I took the first shift with Kent while he helped my daughter. When I saw my son crying and complaining that it was too hard, I pulled him aside and gave him the best “You can do it” speech. I told him that if he gave up now, then he’d always give up because life is hard, and “You have to push yourself because things don’t come easy.” I probably spent 15 minutes coaching. When I grew tired and frustrated, I asked my boyfriend to take over. 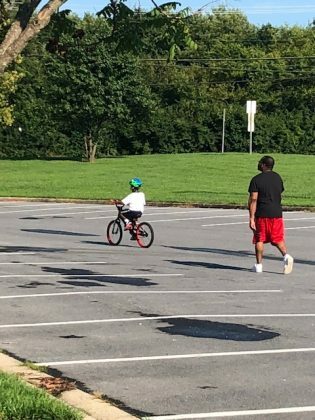 Well, in a few minutes time, he had my son riding through the parking lot on his own. He grabbed the back of Kent’s bike, pushed him forward and said, “Pedal!” and Kent pedaled off. WITH MINIMAL INSTRUCTION! When I saw this, I laughed to myself because of all the coaching I did, but to no avail and all I had to do was push him. “Like an eagle that rouses her chicks and hovers over her young, so he spread his wings to take them up and carried them safely on his pinions” Deuteronomy 32:11 (NIV). I knew this already, but the bike lesson reinforced to me the importance of loving and caring fathers and men in children’s lives. I do believe I’m a good mother, but I know I don’t have everything my children need. My perspective and way of doing things is not always the best, especially when it comes to raising a young man. It also reinforces to me that God really did create men and women as compliments to each other. Yes, I’m speaking in generalizations, so don’t jump down my throat about gender roles, cis-male, etc. The bike lesson taught me that it’s OK to step back and learn a different approach. I have my children’s best interest at heart, but I don’t have all of the answers. I know it’s OK if I step back and let someone else take the lead sometimes. Lauren awesome blog it has open my eyes as well. Thank you for sharing.